The compressive strength of the hardened cement is the essential property when water is added in the cement. Cement hydrates and shows cohesion and solidity. It binds all component together,i.e. cement, sand, aggregate etc. The strength of cement-based compound, such as mortar/concrete depends upon the type and nature of cement. Basically, because of strength,nature of cement, both mortar and concrete are very strong in compression and weak in tension, hence testing of cement for compressive strength is most important because it is the major purpose for which it is used.So that it is essential to know about the compressive strength of cement and it is the most important that the minimum specific strength must be developed. Cement is tested for compressive strength, to ensure the strength and durability of the structure. High lime or high alumina content is responsible for early gain of strength. The strength of cement is also influenced by the degree of burning, the fineness of grinding, and the aeration it receives after final grinding. Cement mortar is used in the strength test because neat cement causes shrinkage and cracking and hence difficult to test. Also Read: Which is the Best Cement for House Construction? The compressive strength of cement gives the idea about the basic cement strength. It gives the assurance for using. From this test, you can find how much cement is required and how much strength it will get. The compressive strength of cement is also the basic data needed for mix design. Cement, basically is known by its compressive strength.Cement is identified by its grade like 53 grade, 43 grade, 33 grade of cement. This grade indicates the compressive strength of cement, i.e. 53 grade of cement indicates that compressive strength of cement cube after 28 days of curing will be 53 N/mm2 (MPa) or 530 kg/cm2. Compression Testing Machine or Universal Testing Machine. Testing material is cement, sand and water. Water quantity (P/4 + 3) % of the total mass of cement and sand. Where P is the standard consistency of cement. First of all, mix cement and sand in dry condition with a trowel for one minute and then add water and mix until uniform colour is obtained. The time of mixing shall not be less than 3 minutes and not more than 5 minutes. Immediately after the mixing, mortar is placed in the cube mould. Before placing the mortar, apply oil on the inner surface of cube mould. For expelling the entrained air and avoiding honeycombing,the mortar shall be prodded 20 times in about 8 s and then compacted by vibration. The period of vibration shall be 2 minutes at the specified speed of 12 000 ± 400 vibrations per minute. After that finish the top surface of the cube in the mould by smoothing the surface with the blade of a trowel. After completion of vibration, keep the filled moulds in a moist closet or moist room for 24 hours. At the end of that period, remove mortar cube from the moulds and immediately submerge in clean, fresh water and keep there until taken out just prior to testing. The cubes shall not be allowed to become dry after they have been taken out and until they are tested. Compression testing machine or universal testing machine is used for testing. Test 3 cubes for compressive strength for each time period as per detailed specifications. Such as 3 cubes for 3 days test, 3 cubes for 7 days test and 3 cubes for 28 days test. The cubes testing shall be conducted on their sides.Do not use any packing between the cube and the steel plates of thecompression testing machine, when testing is conducted. The load shall be steadily and uniformly applied and the rate of loading should be 35 N/mm2/min. Clean appliances shall be used for the experiments. In determining the compressive strength, do not consider specimens that are noticeably defective. Do not consider the specimens, that gives strength differing by more than 10 % from the average value of all the test specimens. Note down the load at which the cube is broken. Compressive strength of the cubes shall be calculated by division of themaximum load applied to the cubes during the test by the cross-sectional area. If your test result is not in range of acceptance criteria, there can be many reasons such as improper mixing, curing and proportion of cement and sand, having a basic defect in cement or sand, error in experiment procedure etc. In that case, accurately perform the test again. If still the test results fail than don’t use such defective material and consult your cement supplier/ manufacturer to replace it. It will be suicidal if to use such cement. Also, check how old the cement is. It is very old or may be hydrated for one or other reasons; this may happen. Hence don’t use such cement.Consult your architect/structural engineer to check whether it can be used for a nonstructural purpose like PCC, internal plaster, mortar bed for flooring etc. This will again be governed by test result.Please do not decide by yourself. Please note that compressive strength of cement is very important property and if cement fails in this test, you should not use such cement. Generally, the compressive strength of cement is tested for 3 days and 7 days. Each test requires 3 cubes.For one cube, 200 gm cement and 600 gm sand are used. Therefore, for one test, 600 gm cement and 1800 gm sand are required. 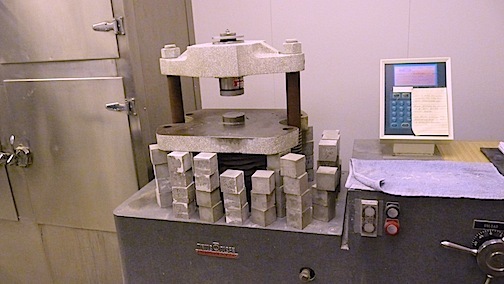 Cost of compressive strength of cement test is around Rs. 200 to 400. Price may generally change according to various factors, i.e. area where a test is conducted, numbers of the testing, relation with the client, the urgency of test results etc. Compressive strength of cement test is conducted at the use of every 50 MT (like 1000 bags) cement or when the source of cement, grade of cement, type of cement and brand of cements are changed. Test frequency may also be changed according to different standard guidelines. Does Cement Loses its Strength Over a Period of Time? Does the Shade of Cement Affects the Quality or the Strength? Previous PostPrevious Various Exterior Cladding Materials to Modernize the Aesthetics of Your Home! Next PostNext What are the Pros and Cons of Masonry in Construction?